No matter whether you have previously owned a pickup truck or not, the towing capacity of the 2014 Chevy Silverado will be an important consideration when deciding which configuration to go with. The Silverado 1500 has very impressive numbers for towing capacity even among the lower trim levels that come with the standard engine. If you want to tow heavier or larger loads, however, this truck can still be a great option, especially if you select the right options, such as the Max Trailering Package. As with any vehicle, the towing capacity of the 2014 Chevy Silverado 1500 depends on the engine that you go with as well as whether you opt for 2WD or 4WD. If you were to get a truck with the 4.3-liter EcoTec3 V6 engine and 2WD (with a 3.23 rear axle), then you could tow 5,900 pounds. When you swap that configuration for 4WD and a 3.42 rear axle, this number increases to an impressive 7,100 pounds despite being the least powerful of the three available engines. There are more rear axle choices for the 5.3-liter EcoTec3 V8 engine, and because of this, there are several different combinations leading to varying towing capacities. The 3.08 rear axle has a max conventional trailering of 6,800 pounds (2WD) or 6,600 pounds (4WD). Going with the 3.42 rear axle increases these numbers to 9,800 pounds and 9,600 pounds, respectively. When you switch to the 3.73 rear axle, this number goes even higher to 11,400 or 11,200 pounds. As you would expect, the best towing capacity comes from the 6.2-liter EcoTec3 V8 engine. The 3.42 rear axle gives you a max conventional trailering of 9,700 pounds for 2WD and 9,500 pounds for 4WD. To increase these numbers to 12,000 and 11,800 pounds, respectively, go with the 3.73 rear axle. No matter which engine, axle, or drive you go with, all 2014 Silverados come with certain towing features that make them even more powerful. These include Trailer Sway Control, Auto Grade Braking, Tow/Haul mode, and StabiliTrack. If you know in advance that you plan on using your 2014 Chevy Silverado 1500 to tow heavy loads, consider adding on the Max Trailering Package, which is an option with either of the two more powerful engines. This greatly increases the towing capacity, allowing you to reach the numbers mentioned above while still easily controlling your truck. 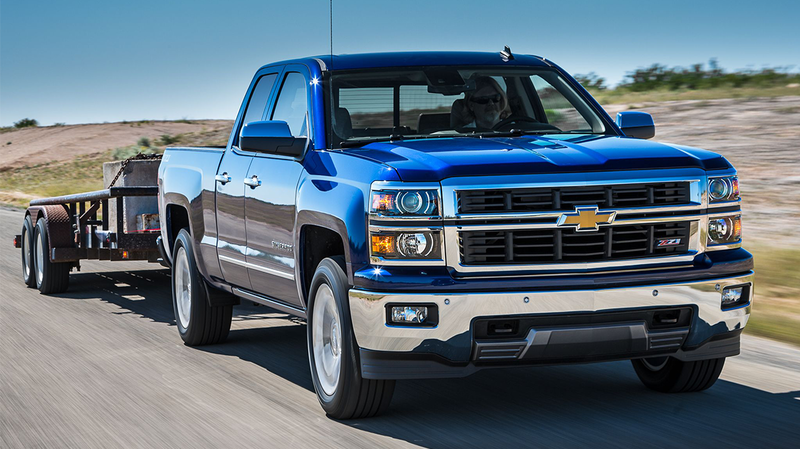 The experts at Pat McGrath Chevyland in Cedar Rapids, Iowa, can answer any questions you may have about the towing capacity of the 2014 Chevy Silverado 1500 and help you pick the right configuration for your needs.